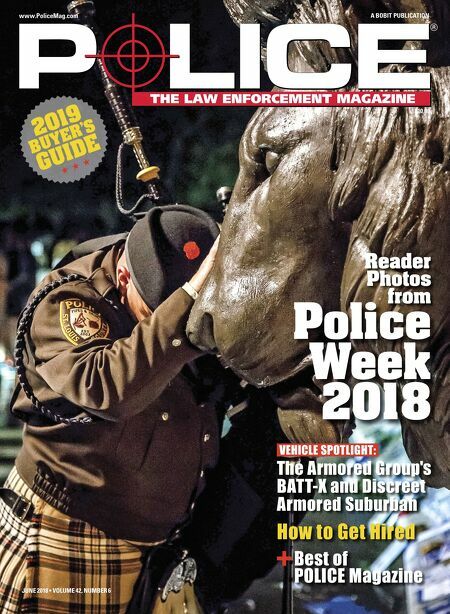 Enter to WIN POLICE Magazine's Well Dressed Bicycle Officer Contest! 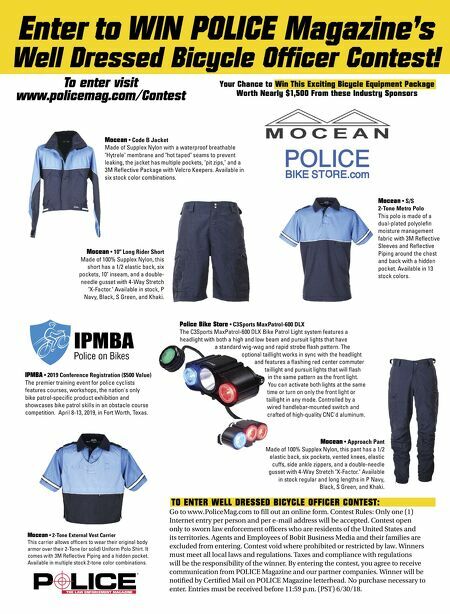 To enter visit www.policemag.com/Contest Your Chance to Win This Exciting Bicycle Equipment Package Worth Nearly $1,500 From these Industry Sponsors TO ENTER WELL DRESSED BICYCLE OFFICER CONTEST: Go to www.PoliceMag.com to fill out an online form. Contest Rules: Only one (1) Internet entry per person and per e-mail address will be accepted. Contest open only to sworn law enforcement officers who are residents of the United States and its territories. Agents and Employees of Bobit Business Media and their families are excluded from entering. Contest void where prohibited or restricted by law. Winners must meet all local laws and regulations. Taxes and compliance with regulations will be the responsibility of the winner. By entering the contest, you agree to receive communication from POLICE Magazine and our partner companies. Winner will be notified by Certified Mail on POLICE Magazine letterhead. No purchase necessary to enter. Entries must be received before 11:59 p.m. (PST) 6/30/18. ® Mocean • 2-Tone External Vest Carrier This carrier allows officers to wear their original body armor over their 2-Tone (or solid) Uniform Polo Shirt. It comes with 3M Reflective Piping and a hidden pocket. Available in multiple stock 2-tone color combinations. Police Bike Store • C3Sports MaxPatrol-600 DLX The C3Sports MaxPatrol-600 DLX Bike Patrol Light system features a headlight with both a high and low beam and pursuit lights that have a standard wig-wag and rapid strobe flash pattern. The optional taillight works in sync with the headlight and features a flashing red center commuter taillight and pursuit lights that will flash in the same pattern as the front light. You can activate both lights at the same time or turn on only the front light or taillight in any mode. Controlled by a wired handlebar-mounted switch and crafted of high-quality CNC'd aluminum. Mocean • Code B Jacket Made of Supplex Nylon with a waterproof breathable "Hytrele" membrane and "hot taped" seams to prevent leaking, the jacket has multiple pockets, "pit zips," and a 3M Reflective Package with Velcro Keepers. Available in six stock color combinations. Mocean • S/S 2-Tone Metro Polo This polo is made of a dual-plated polyolefin moisture management fabric with 3M Reflective Sleeves and Reflective Piping around the chest and back with a hidden pocket. Available in 13 stock colors. Mocean • 10" Long Rider Short Made of 100% Supplex Nylon, this short has a 1/2 elastic back, six pockets, 10" inseam, and a double- needle gusset with 4-Way Stretch "X-Factor." Available in stock, P Navy, Black, S Green, and Khaki. Mocean • Approach Pant Made of 100% Supplex Nylon, this pant has a 1/2 elastic back, six pockets, vented knees, elastic cuffs, side ankle zippers, and a double-needle gusset with 4-Way Stretch "X-Factor." Available in stock regular and long lengths in P Navy, Black, S Green, and Khaki. IPMBA • 2019 Conference Registration ($500 Value) The premier training event for police cyclists features courses, workshops, the nation's only bike patrol-specific product exhibition and showcases bike patrol skills in an obstacle course competition. April 8-13, 2019, in Fort Worth, Texas.